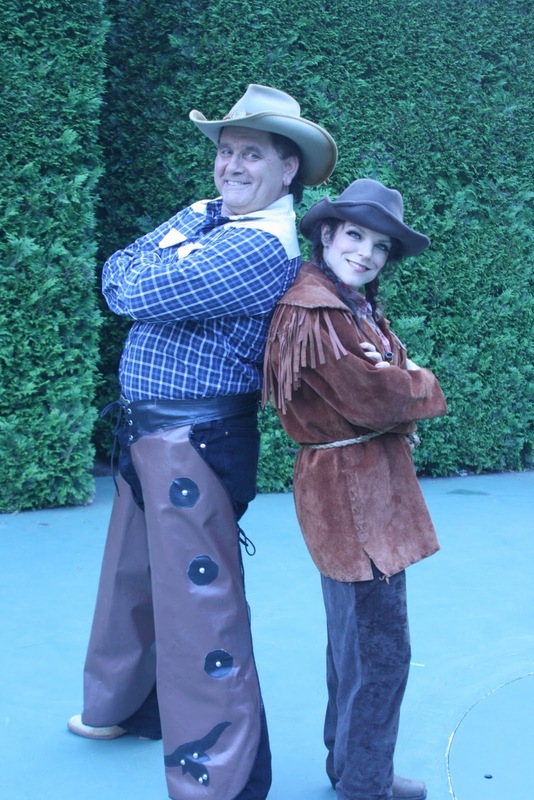 Delaware Arts Info: Folks, Get Your Tickets...Annie's Got Her Gun! Folks, Get Your Tickets...Annie's Got Her Gun! Annie &Frank. Photo courtesy of The Brandywiners. Danielle Rice is Executive Director of the Delaware Art Museum. She and her husband, Dr. Jeffrey Berger, are theater and music lovers and support all of the arts in Delaware. It certainly didn’t hurt that the weather was absolutely perfect, but we were thrilled to finish off a busy week with dinner and a show al fresco. The Brandywiners –that energetic community theater group that has been staging summer shows at Longwood Gardens for 60 years – this year arranged a special 15% discount for theater-goers with local restaurants. So we gladly started our evening with a relaxed (and discounted!) dinner at Buckley’s. We arrived at Longwood with half an hour to spare and we spent it strolling amidst the glorious gardens. There’s nothing better for washing away the stresses of the workweek! We were delighted to see that the outdoor theater was almost full to capacity with a diverse and enthusiastic crowd, and, of course, we always love seeing the illuminated fountains that serve as curtains while we wait for the show to begin. Annie Get Your Gun is based on the remarkable true story of Annie Oaklely, the first major American entertainment celebrity. Born in poverty in rural Ohio, Annie supported her family with hunting and trapping and at age 15 she defeated Frank Butler in a shooting match but won his heart. The two were married and enjoyed a long relationship and partnership in Buffalo Bill’s Wild West Show. The Broadway musical, which opened at the Imperial Theatre on May 16, 1946, was written specifically for Ethel Merman, with music and lyrics by Irving Berlin from the book by Herbert and Dorothy Fields. It was the biggest Broadway hit of Merman's career. The 1999 Broadway revival, which showcased Bernadette Peters, was updated for modern times. Not only did Peter Stone make revisions to Herbert and Dorothy Fields's original book (the story is now a show within a show, namely Buffalo Bill's Wild West Show), but there have been revisions to Berlin's original score as well. It is this version that The Brandywiners are staging at Longwood Gardens this summer. The show opens with that old time favorite, There’s No Business Like Show Business which becomes the recurring theme (and of course we all go out humming it to ourselves). Other recognizable tunes include That Girl That I Marry, You Can’t Get a Man with a Gun and of course, the absolutely delicious Anything You Can Do, which will have your kids singing for a long time to come! The Brandywiners’ production features clever sets that roll in and out of the hedges and dazzling costumes. Rebecca Buswell Kostifas gives us an adorable and energetic Annie who blasts out her numerous songs with confident gusto. Robert Welch is cast as Frank Butler – the man that Annie has to figure out how to win over after winning over him with her shooting. While a bit stiff as an actor, Welch has a lovely voice that pairs beautifully with Kostifas’. It took the large cast a bit of time to get into the swing of things and the first act dragged a bit, but the second act was sheer delight. The Ballroom Scene was exquisite in the unadorned garden setting and the choreography was tight and effective. The dance performed by Winnie (Carolyn Peck) and Tommy (Ricky Rotandi) was exceptional. And of course, I would be remiss if I didn’t mention the delightful children’s ensemble and in particular Jessie (Alie Weldon), Nellie (Nicole Hemphill) and Little Jake (Misha Teixido) who perform a show-stopping Doin’ What Comes Natur’lly in the first act. 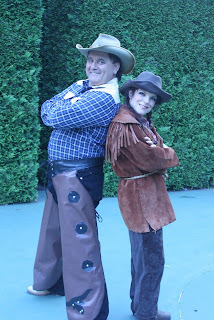 All in all, Annie Get Your Gun marks another ambitious success for The Brandywiners, and it is well worth seeing. Be sure to check out all the area restaurants that are offering the discounted dinners throughout the run of the show. Get tickets and additional information at: www.brandywiners.org but please, leave your guns at home! Pegasus Trio Makes Milford Musical This Week!